Each ten minute episode is crammed full of pop culture spoofs and gags, as well as a few original creations synonymous with Mad Magazine, such as famous black and white spies of Spy vs. Spy. Many of the cartoon skits are directed at recent pop culture events, such as the spoofs of The Social Network and Twilight, though occasionally some older items are used, such as Jurassic Park, Pokemon and The Fresh Prince of Bel Air. 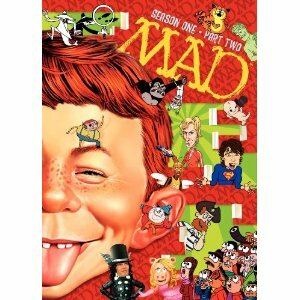 There are thirteen ten minute episodes included in this single-disc set of the second part of season one. The series has the feel of the Alfred E Neumna magazines, even though it has been updated for the faster pace of this generation.